We have the best location in the city. We have an incredible rooftop hangout with stunning views of the cathedral. We have big family dinner parties every night on the roof. 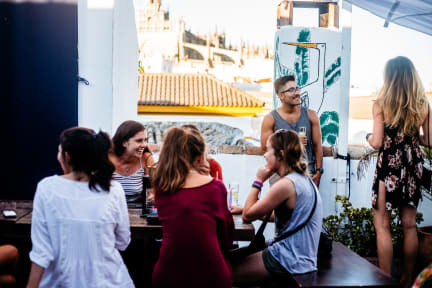 We love showing people our side of Seville, and our personal favourite spots to eat, drink and chill. La Banda was dreamt up 8 years ago by 2 brothers and 2 best friends from the UK whilst travelling in Latin America. Our concept is simple La Banda = the gang of friends. This is the vibe that we strive to create in every aspect of the hostel. From the moment you enter, you become part of La Banda. Our clientele are young, open-minded travellers with a passion for people, music and culture. If this sounds like you, then we would love you to come and be part of our Andalusian adventure. • A funky reception lounge, themed on our favourite music and art from around the world. We’ve board games, free computers, free wifi, and someone around 24 hrs a day to help you out. • A fantastic kitchen, with great utensils, lots of cooking space and food storage. • A laidback rooftop garden where we get together for family meals, art nights, great cocktails, drinking games and live music! • Clean, modern rooms with free lockers, free padlocks and bed linen. • Amazing free walking tours with young, passionate, English/French/Spanish speaking guides who seriously know their stuff. • We can help you see the best flamenco in the city, eat the best tapas, and see the sights other tourists don’t know about. • Every night is something going on at the hostel. Live flamenco shows on the roof, nights out to the most underground bars in the city, live DJ Sessions and Pub Crawls to the best clubs in Sevilla! This is not a corporate chain hostel. We are an intimate, down-to-earth group of mates who love travelling and socialising. Come be a part of it! We do NOT accept guests under the age of 18 years old. You will be refused accommodation and will be charged the first night of your accomodation. During normal season this property has a 48 hour cancellation policy. PLEASE check below for special season dates & conditions. There will be no charge, providing you notify us directly in writing by 00:00 two full days prior to arrival date. Any cancellation made after this time will be charged the first night of the reservation. Any modification will be charged the first night modified. Any No-Show will be charged the equivalent of two nights. Groups of over 6 people must contact directly with the hostel before booking. Melhor hostel que já fiquei. É muito bem localizado. Os funcionários são extremamente simpáticos, gentis e prestativos, especialmente a Andrea! Nota 10 para todos! Um dos melhores (senão o melhor) hostels que já me hospedei. É aconchegante, limpo, camas confortáveis, ótimo breakfast, um staff muito atencioso sempre dispostos a nos ajudar e uma programação de eventos que não nos deixa sem ter o que fazer mesmo em um domingo à noite, e que proporciona um clima bacana pra fazer amigos entre todos que lá se hospedam. Os jantares no rooftop foram sensacionais, com direito até a música ao vivo e shots grátis. Obrigado a toda a equipe. Adorei tudo ! Ambiente bacana pessoas simpáticas . Camas ótimas . Quarto e banheiro bom. Café da manhã excelente. Jantar comunitário mt legal. Very nice place with lovely staff. Every night happens an HH and dinner at the rooftop for cheap prices, which makes an easy atmosphere for relaxing after the day and meeting new people. Definitely I recommend the stay. As instalações não são nadas parecidas com as fotos, além que de o quarto do terceiro andar, onde fiquei, é exatamente do lado do rooftop, e o barulho incomoda até a meia noite. Além disso, o wifi não pegava e banheiro nao foi limpo, ficando com um cheiro muito forte. Quarto abafado! A menina da recepção foi ótima, mas essa é a única coisa boa que tenho pra dizer.